Daffodil Design - Calgary Design and Lifestyle Blog: how divine. today i share with you one of my favorite things... simple packaging. i love white or brown gift bags from the dollar store, brown lunch sacs, or solid color wrapping paper. add a cute ribbon, yarn, and a handmade seal or tag and the outside will be just as good as what's on the inside! that's why i fell in love with divine twine. i can hardly wait to receive my goodies in the mail... cotton candy, aqua and oyster are the colors i've picked. they'll be adorable on goodies we pass out to our new neighbors, not to mention, look pretty sitting in my office. 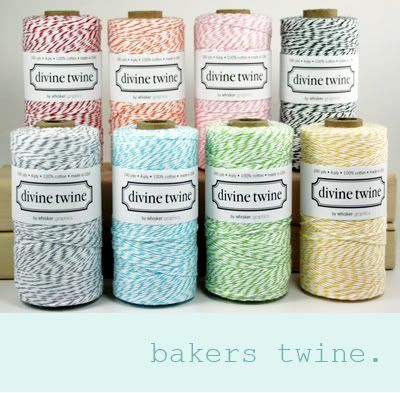 divine twine is made from 100% cotton so it's soft to the touch, bio-degradable and earth-friendly. Plus the 4-ply construction makes it nice and strong. Each spool contains 240 yards, enough to last you a long time, yet easy to store! check back soon for free printable seals and tags for your own simple packaging!